Bosses at a Derbyshire ceramics company say its future is safe after it was bought for £30m. 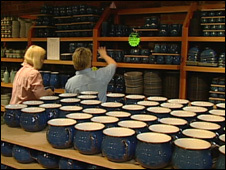 The 200-year-old Denby Pottery firm has faced pressure from the drop in retail sales and made 35 redundancies earlier in the year. But its UK and US businesses have now been bought by a team led by managing director Gary Biggs. The firm said £72m of debt was also being written off to guarantee its immediate future. Mr Biggs said: "We are delighted that we have been able to secure a future for the Denby Pottery Company in what are unprecedented times both for the tableware industry and the global economy. "With Denby's financial position now secure, we are looking to make a number of quality strategic acquisitions in the sector." A spokeswoman for Denby said the firm could not give a guarantee that all jobs would be safeguarded as a result of the buyout and said it depended on how trading went over the next few months. The firm employs 665 people worldwide with 465 of them working at the headquarters in Denby, Derbyshire.